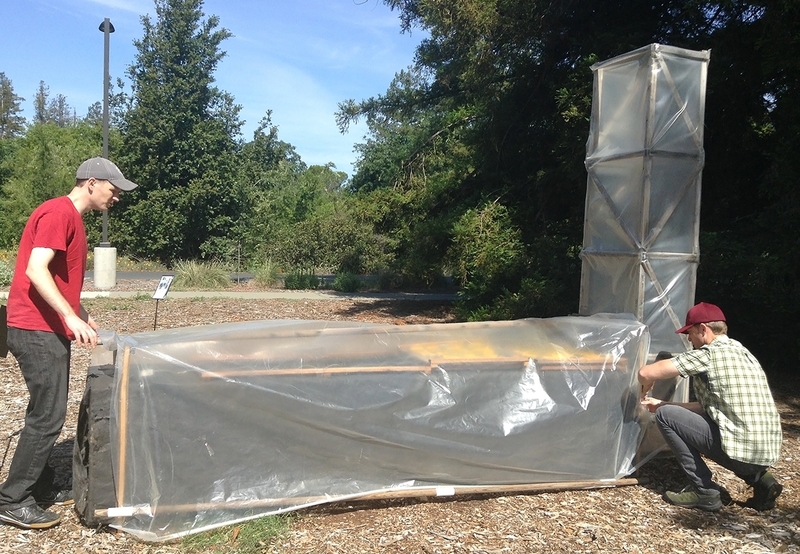 Planted in a corner of the UC Davis campus is a display of technologies and vegetable crops that researchers with the Horticulture Innovation Lab have been using with farmers in Africa, Asia and Central America. Led by UC ANR's Elizabeth Mitcham in the UC Davis Department of Plant Sciences, this program harnesses the agricultural expertise of a network of U.S. university researchers to improve how farmers in developing countries grow fruits and vegetables. More often than not, the learning goes both ways: Adapting solutions for farmers on another continent can spark ideas that might be useful back home too. Recently a team from UC Cooperative Extension in Fresno County — led by Ruth Dahlquist-Willard, UC Cooperative Extension advisor for small farms in Fresno and Tulare counties — worked with the Horticulture Innovation Lab to learn how to build one of these technologies, to try out with local farmers. Here is a working chimney solar dryer on the UC Davis campus. Grad student Nick Reitz, left, adjusts the plastic cover over trays of sliced mango with help from Archie Jarman, right, of the Horticulture Innovation Lab. Reitz was practicing using the dryer before working with farmers in Ghana. The low-cost technology they built, called a “chimney solar dryer,” combines continuous air flow with solar heat to dry fresh produce more efficiently than a traditional solar dryer. It was designed by the innovative duo Michael Reid and Jim Thompson, both emeritus specialists with UC Cooperative Extension who have worked on multiple inventions with the Horticulture Innovation Lab. The chimney solar dryer is usually built with basic materials, such as plywood, dark plastic, clear plastic, and food-grade mesh. 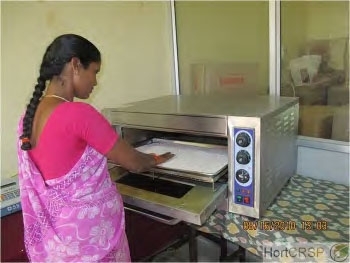 Read more about how the chimney solar dryer can help farmers add value to crop surplus (PDF). 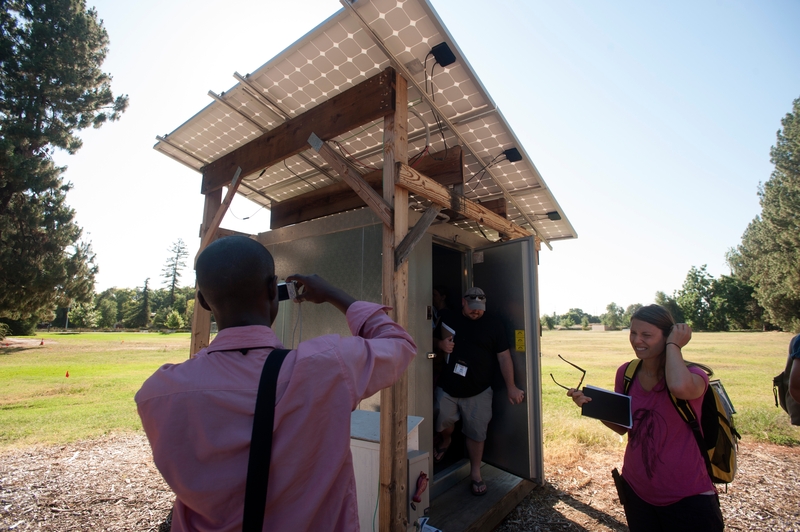 This solar-powered cold room uses a tool designed by an American farmer, called a CoolBot. In a well-insulated room, a CoolBot can trick a household air conditioner into bringing temperatures down low enough for cool storage of fresh produce. Cooling fruits and vegetables soon after harvest from the field can reduce postharvest losses and extend shelf life. So far teams with the Horticulture Innovation Lab have used the CoolBot with farmers in Tanzania, Zambia, Uganda, Thailand, Cambodia, Bangladesh, India and Honduras. 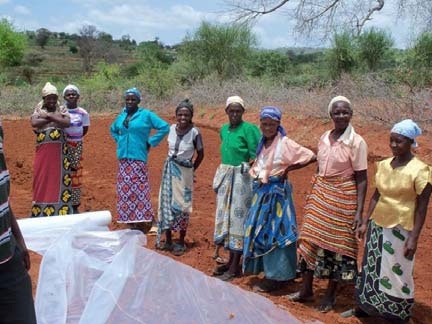 Read more about how this farmer's invention is reducing postharvest losses around the world. The zero-energy cool chamber (known as ZECC) is a simple structure built from brick and sand that can help cool fresh produce, in conditions where evaporative cooling is effective. By regularly wetting the sand and brick, farmers or even marketers can keep the temperatures low and the humidity high for fresh produce such as leafy greens. 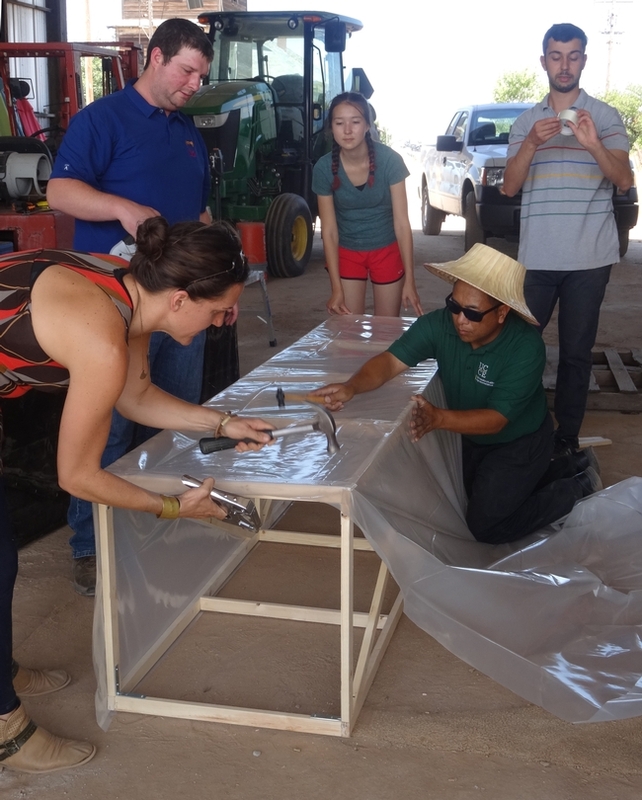 Researchers with the Horticulture Innovation Lab have been testing what specific conditions — such as hot, arid climates with easy access to water — make this tool effective for farmers to use to cool their fresh fruits and vegetables. More information about the ZECC is available from the UC Postharvest Technology Center. 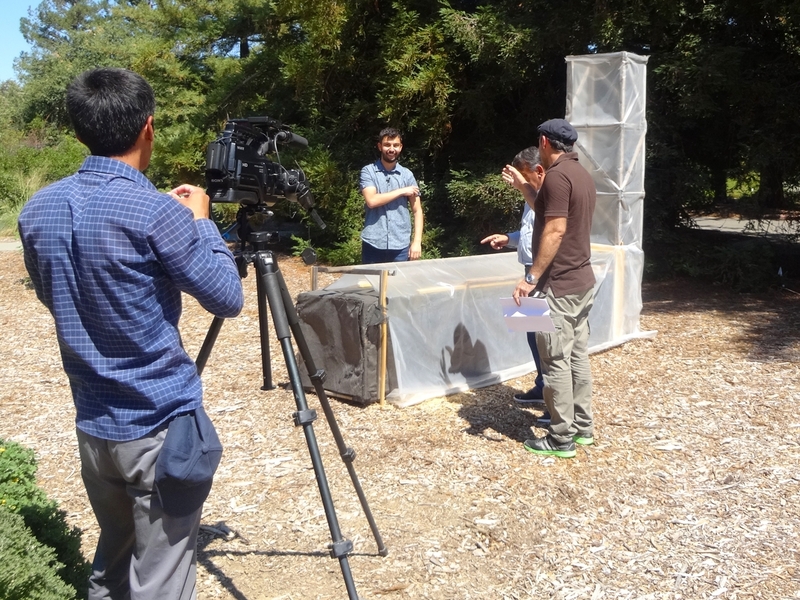 This week the Horticulture Innovation Lab Demonstration Center hosted a media crew from Tajikistan, shown here talking with Angelos Deltsidis, center, about using solar dryers for drying apricots in Tajikistan. Photo by Khush Bakht Aalia for the Horticulture Innovation Lab. Recent visits to the Horticulture Innovation Lab's demonstration center have come in many shapes and sizes — from people walking by who stopped to read some of the signs, to group activities planned in advance. Recent tours of the center have included a delegation of deans from agricultural colleges in Ethiopia, a television news crew from Tajikistan and high school students from California learning about innovation and human-centered design. Next time you're on the UC Davis campus, consider dropping by the Horticulture Innovation Lab demonstration center. You can find it on the campus map, or contact the team for a more focused tour. Maybe it will spark an innovative idea that you can use in your fields? Led by UC Davis, the Horticulture Innovation Lab is funded by the U.S. Agency for International Development (USAID) as part of Feed the Future, the U.S. government's global hunger and food security initiative. Nutrition, food security and sufficient family incomes are challenges in many parts of the world. Half the world’s people live in rural areas in developing countries. 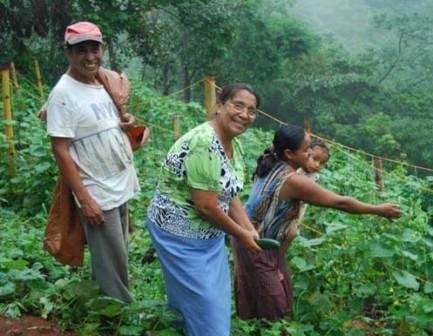 Because hunger and malnutrition are often linked to poverty, providing economic opportunities through horticultural production not only helps family incomes, but also addresses food security and nutrition. Training women to produce and market horticultural crops in the developing world also helps provide a much-needed income stream for families with children. UC Davis is addressing food security and economic development in Africa, Southeast Asia, Central America, and elsewhere, by coordinating an international horticulture program. The Horticulture Collaborative Research Support Program (Hort CRSP; pronounced "hort crisp") is one of 10 CRSP programs that focus on global food production and solving food and nutrition problems in developing countries. UC Davis leads the Hort CRSP, with funding support from the U.S. Agency for International Development (USAID). In the three years since the program’s inception, several projects have been completed, and many are ongoing. The program’s website offers a plethora of information, along with newsletters that highlight individual projects. 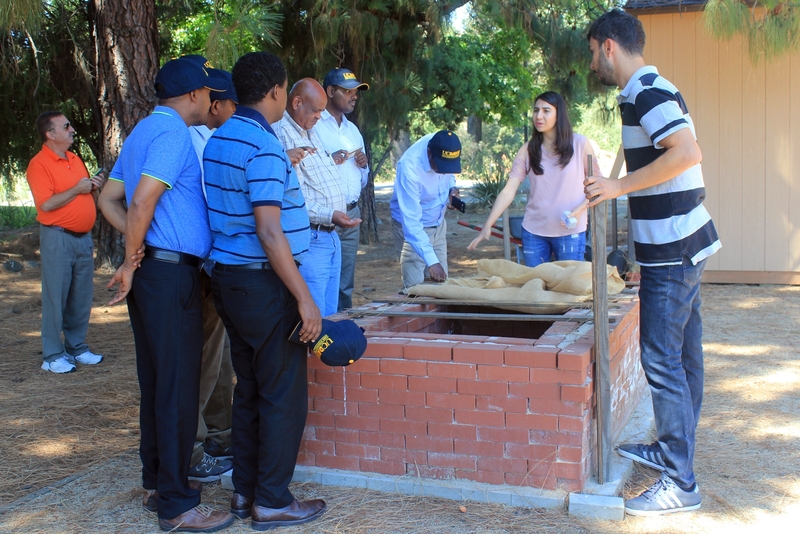 UC Davis, ranked first in the U.S. on research related to agriculture, food science and nutrition, and plant and animal science, is positioned to serve global needs related to food and nutrition. Of the 10 CRSP programs administered by USAID, two of the programs are based at UC Davis — the Hort CRSP program, and the BASIS CRSP, which was highlighted in a recent Food Blog post and addresses financial issues related to agricultural productivity.